Scarpeci, T. E., Zanor, M. I. and Valle, E. M. (2017). Estimation of Stomatal Aperture in Arabidopsis thaliana Using Silicone Rubber Imprints. Bio-protocol 7(12): e2347. DOI: 10.21769/BioProtoc.2347. Estimation of stomatal aperture using low viscosity silicone-base impression material has the advantage of working with the whole leaf. The developmental stage and the environment strongly affect the stomatal aperture. Therefore, it is mandatory to have accurate estimations of the stomatal aperture of intact leaves under different situations. With this technique, it is possible to get the real picture at any moment. The outputs of the data include studies on cell area and morphology, epidermis cell and stomata lineages, among others. This protocol is useful for the accurate estimation of stomatal aperture in many samples of intact leaves in Arabidopsis thaliana. The epidermis of all leaves has specialized cells, the guard cells, surrounding microscopic pores. The guard cells and pores are called stomata, and they permit gas exchange and diffusion of water vapor between the atmosphere and the interior of the leaf. Stomata are products of an intracellular program, which generates the specific stomatal patterns during their development (Kagan et al., 1992). Stomata are found both in the abaxial and adaxial sides of the leaf, although the stomatal density (and starch accumulation) is higher on the abaxial side of the leaf sheath in Arabidopsis thaliana (Schlüler et al., 2003; Tsai et al., 2009). The stomatal density is controlled by endogenous and exogenous factors in Arabidopsis thaliana (Berger and Altmann, 2000; von Groll et al., 2002). Stomatal aperture actively responds to changes in the environment and regulates leaf transpiration rates (Santelia and Lawson, 2016). An accurate estimation of the stomatal aperture provides insight into the impact of environmental stress on plants. Arabidopsis seeds were sown on soil in 10-cm pots and grown in a closed cabinet under a 16 h light/8 h dark photoperiod using fluorescent light at 120 µmol m-2 sec-1 at 23 ± 2 °C, and a relative humidity of 65-70%. For measurements, the younger, fully expanded and flat leaves of a 21-d-old Arabidopsis plant (i.e., third and fourth leaves) were harvested for immediate use. Leaf sampling should be done at the same time of the day to avoid any potential rhythmic effects. Leaves used for impressions are from plants grown in parallel under identical conditions. Mix silicone low viscosity impression material (Polysiloxane) and catalyst/hardener in the approximate ratio 1:0.75. In case the whole leaf is covered with the material, mix 2 cm of silicon low viscosity impression material and 1.5 cm of catalyst/hardener. Mix very well using a spatula for about 30 sec (Figure 1A). Apply the mixture immediately to the abaxial surface of the leaves using a spatula and minimal pressure (Figures 1B and 1C). At 23 °C, hardening will usually take 4-5 min. After hardening, clip the tip of the leaf and peel along with the direction of the main leaf vein (Figures 1D and 1E). Make a positive impression by covering the silicone imprints with a thin layer of a clear nail varnish and leaving it to dry for at least one hour at room temperature (Figure 1F). Place the silicon rubber impression on a glass slide with the positive impression (surfaced covered with varnish) facing down. Transfer the thin layer of nail varnish to the glass slide by gently pressing the silicone rubber onto it (Figures 1G and 1H). High temperature or greater amount of catalyst/hardener will speed up hardening. Close hardening material properly after use. Silicone imprints can be stored for a long time at room temperature and be reused. Observe imprints under a light microscope using a 60x objective lens and take micrographs of the magnified image. Measure the width and length of stomatal aperture (Figure 2) using the image processing software ImageJ (http://rsb.info.nih.gov/ij/). Since the imprints are usually not totally flat, not all regions of a leaf section are in focus. The leaf section is considered to be in focus when the edges of the cells are clear and sharp. To solve this problem, several photographs of the leaf section can be taken at different focal depths. 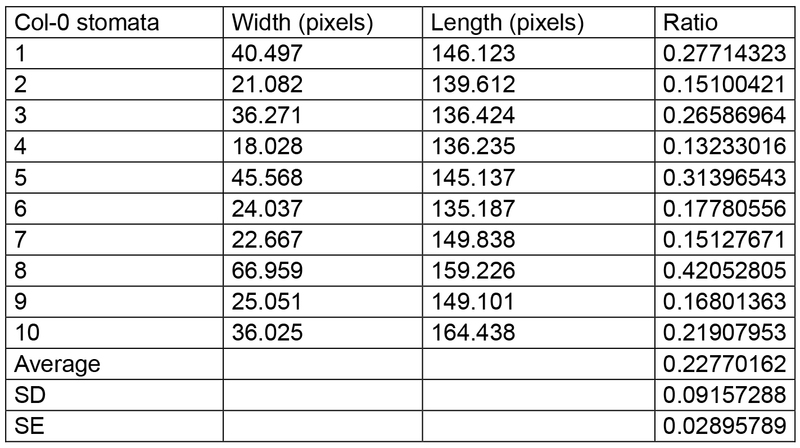 Do not use images for measurements that are out of focus. Figure 2. 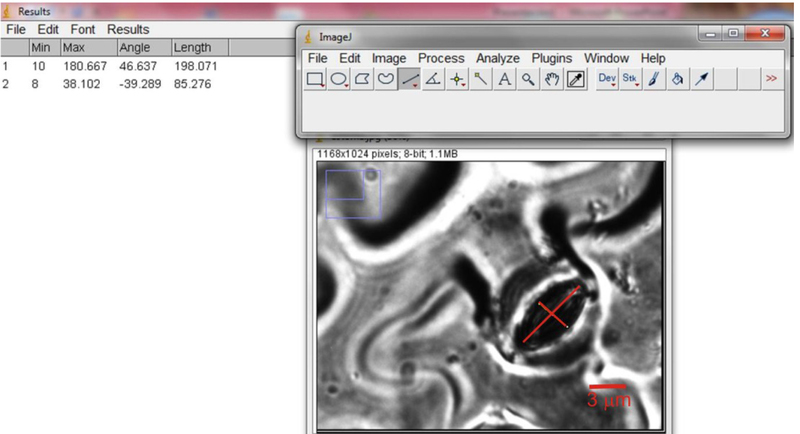 Snapshot of ImageJ software showing a representative measurement of length and width of a stomata. Scale bar = 3 µm. The number of stomata analyzed on a typical silicon imprint was 30-40. These stomata were randomly selected in the separate microscopic fields in the same slide. Ten leaves per Arabidopsis line were analyzed. Compile the data and calculate the ratio between the width and length of all selected stomata using Excel spreadsheet software. The data obtained were statistically evaluated using ANOVA (Sigma Plot software, version 11.0). Consider a P-value less than 0.05 as statistically significant. Perform the experiment at least three times. An example with ten measurements carried out using three leaves of Arabidopsis accession Columbia (Col-0) is shown in Table 1. Note: Columbia (Col-0) is the most widely-used accession of Arabidopsis thaliana. Note: Other results of stomatal aperture were published in Scarpeci et al., 2017. This work was supported by ANPCyT and CONICET, Argentina. This protocol was modified from previous work (Weyers and Johansen, 1985). Berger, D. and Altmann, T. (2000). A subtilisin-like serine protease involved in the regulation of stomatal density and distribution in Arabidopsis thaliana. Genes Dev 14(9): 1119-1131. Kagan, M. L., Novoplansky, N., and Sachs, T. (1992). Variable cell lineages form the functional pea epidermis. Ann Bot 69(4): 303-312. Santelia, D. and Lawson, T. (2016). Rethinking guard cell metabolism. Plant Physiol 172(3): 1371-1392. Scarpeci, T. E., Frea, V. S., Zanor, M. I. and Valle, E. M. (2017). Overexpression of AtERF019 delays plant growth and senescence, and improves drought tolerance in Arabidopsis. J Exp Bot 68(3): 673-685. Schlüler, U., Muschak, M., Berger, D. and Altmann, T. (2003). 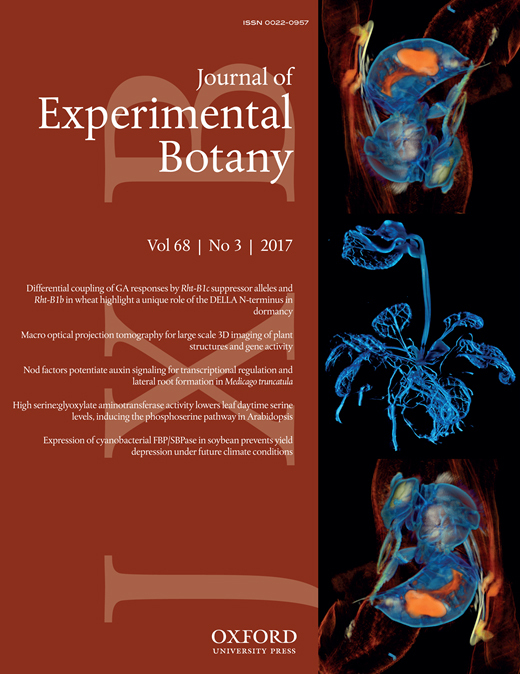 Photosynthetic performance of an Arabidopsis mutant with elevated stomatal density (sdd1-1) under different light regimes. J Exp Bot 54(383): 867-874. Tsai, H. L., Lue, W. L., Lu, K. J., Hsieh, M. H., Wang, S. M. and Chen, J. (2009). Starch synthesis in Arabidopsis is achieved by spatial cotranscription of core starch metabolism genes. Plant Physiol 151(3): 1582-1595. Von Groll, U., Berger, D. and Altmann, T. (2002). The subtilisin-like serine protease SDD1 mediates cell-to-cell signaling during Arabidopsis stomatal development. Plant Cell 14(7): 1527-1539. Weyers, J. D. B. and Johansen, L. G. (1985). Accurate estimation of stomatal aperture from silicone rubber impressions. New Phytol 101: 109-115. How to cite: Scarpeci, T. E., Zanor, M. I. and Valle, E. M. (2017). Estimation of Stomatal Aperture in Arabidopsis thaliana Using Silicone Rubber Imprints. Bio-protocol 7(12): e2347. DOI: 10.21769/BioProtoc.2347. We purchased the material in Rosatio, Argentina at a dentist shop that imported it from Zhermack, Germany. Both, the silicone and the catalyst are in the same package. Attached please find a picture of the reagents. Thank you very much! Your answer is of great help to me. May I ask where the Silicone low viscosity impression material (Polysiloxane) and hardener/catalyst used in your experiment was purchased? Can you provide a packaging picture of the reagent or a specific way to buy it? Thank you very much. I just shared a picture of the material, in case you have further questions, please, let me know. Good luck!